It was a busy weekend with a couple of sessions on the plot. I snaffled 330l dalek bargain on fleabay and collected it in Mum’s car this morning. The should be enough for me with the other 220l one, being still a beginner at this. I plan to empty out the ageing compost in the 220l bin and use it in old compost bags to grow squashes in next season. Am quite excited by that prospect! I’ve also done some better measuring so I can ponder over plot plans in the winter evenings. This is my latest effort. The shed’s at the west end of the plot, the long bed is at the east end and a 6ft hedge runs along the south border. 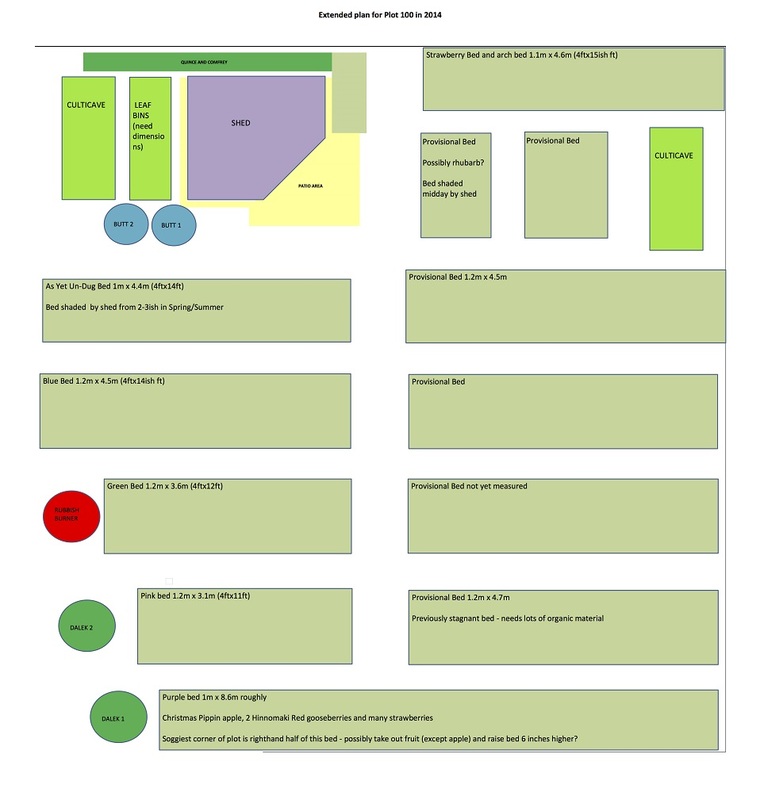 The plot isn’t square, and I have no snazzy drawing programmes, so this is the best that I can do in Excel. 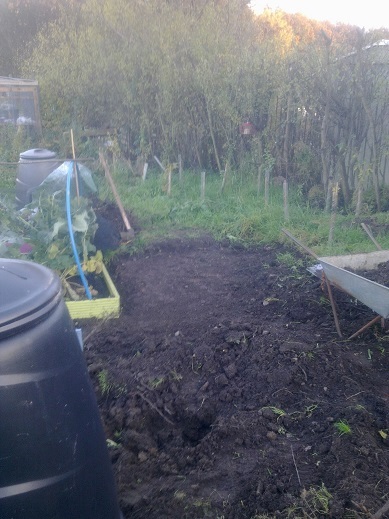 It’s pretty much to scale – side paths are mostly 55cm wide and the centre path will be 80cm wide – all woodchip as looking after grass is a proper pain. I’m still not sure where to put the permanent fruit bushes though, so it might yet change again…I might switch the culticave and the second little East-West bed around and put currant bushes in it. 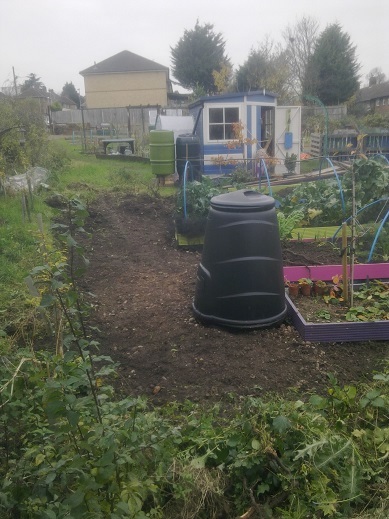 The top strawberry bed might change – it was perfect till my new neighbours put a massive pallet compost bin along their border. I think it will shade that bed, and in any case, I’d like to grow something that screens the bins a bit. Still no sign of the Carcassone garlic, but the Provence cloves in pots in the shed are beginning to show through. The cavalo nero is growing well and I plan on picking some next week for dinner. Tonight is the start of the snooker, with a celebratory roast dinner, starring my own potatoes, broad beans and carrots, and somebody else’s celeriac, kale & meat. Can’t believe I am saying this, but I really miss courgettes!